It's hard to believe that we're into February now! I feel like I lost the whole month of January. As I mentioned before, I started the month with the flu and then spent the rest of the month recovering. Ugh! I took a leave of absence from Word Art Wednesday to recover. I sure have missed my craft room and making projects for the challenges at Word Art Wednesday. This week our focus verse is Galatians 5:22-23, "But the fruit of the Spirit is love, joy, peace, longsuffering, gentleness, goodness, faith, meekness, temperance: against such there is no law." A life lived pleasing to the Lord will show these fruit. A tough challenge to be sure but as we grow in our relationship with Him, these things should be more and more evident in our lives. As I looked at the list, I realized that if we are loving others as God would have us love them, the rest of the list will start to fall in place a littler easier. If we love someone it's easier to be longsuffering (patient), gentle, good, etc., towards them. So with this in mind, I focused my card this week on the "love" aspect of the fruit of the Spirit. One of our sponsors, Robyn's Fetish, generously gave the DT some images to play with. I was able to play with the image called "i heart u". This image comes with the sentiment on the heart and by itself. I can see myself using it again and again. 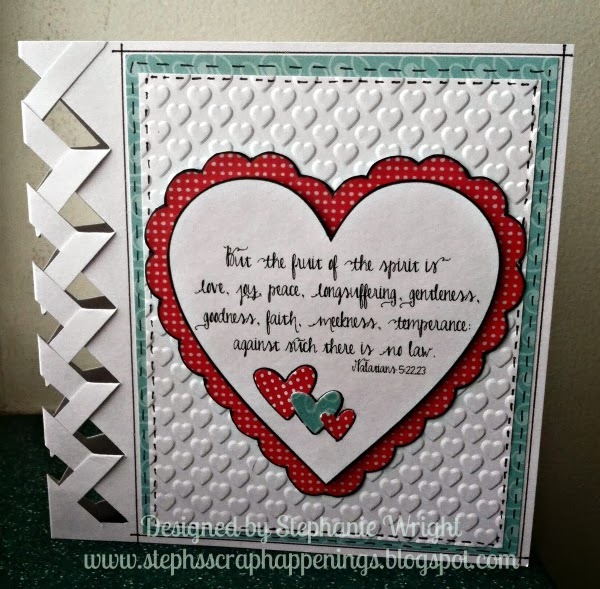 Once again, I used one of my favorite techniques and paper pieced the hearts. After I fussy cut both hearts, I went around the edges with a black Copic marker. For the red, ruffled heart, I used 2 layers of clear embossing powder (apply versamark, cover with embossing powder, heat, cool, repeat) to give it a shiny look. On the white heart, I covered the sentiment that comes on it with this week's focus verse. A few heart die cuts were added to the bottom of this panel for a little more "heart" interest. Each heart was given several coats of a clear Wink of Stella glitter pen and then a coat of glaze. The white heart is popped up over the red heart. You may be wondering about the edge detail on the card. Well, one of the side effects of feeling lousy for several weeks was that I watched LOTS of crafty videos on YouTube. I learned several new things I want to try in upcoming projects. This braided card was one at the top of my list. I saw this technique demonstrated in a video by Brandy Cox. Here is the blog post featuring not only the video but also a free download for the template she designed to make the necessary cuts. It's a lot of fun, and I have plans to use this on another card that I hope to share with you in the next few days. I hope you'll stop by the Word Art Wednesday blog to see the rest of the projects made by the DT and to pick up your free WORDart digi. Also, be sure to stop by Robyn's Fetish for LOTS of great digital stamps. Beautiful and delicate card. Thanks for sharing with us at Scrapbook Blessings Club! 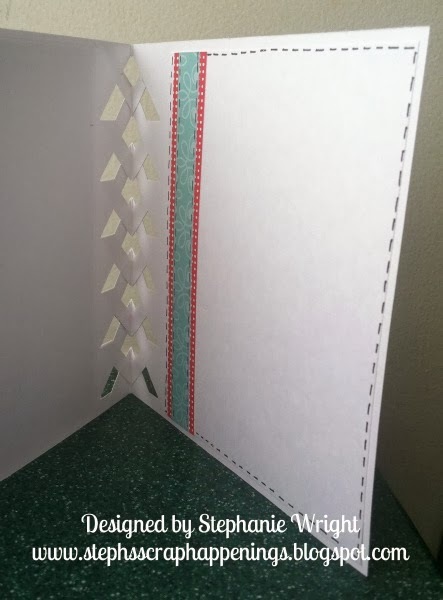 Beautiful card, I love the weave you created. Thank you for joining us at SBC. Love the lattice type edge on this card! Thanks for joining us at Scrapbook Blessings Club.